swamy was born to manni ammAL and appan iyengar (thiruthaNkAl appan AchArya vamsam who later became sishyas of srI vAnamAmalai mutt) dhampathi in vAnamAmalai (thOthAdhri) dhivya dhEsam and was named nArAyaNan (emperumAn's name at thiruthaNkAl dhivya dhEsam). He is a dhauhithran (maternal grand-son) of 27th pattam swamy in his pUrvAsramam (manni ammAL is the daughter of 27th pattam swamy in his pUrvAsramam). He became svIkAra puthrar (adopted son) of dheivanAyakam iyengAr (vAnamAmalai). In his early days, he studied upto SSLC at the local pAtasAlai (school). He had his pancha samskAram (samAsrayaNam) under 27th pattam swamy. He mastered dhivya prabhandham during that time itself. Following the orders of 27th swamy, he gave up material studies/pursuits and started serving the mutt at an early age. He started hearing sampradhAya grantha kAlakshEpam from 27th pattam swamy at that time. He also studied vyAkaraNam, tharkkam, pUrva mImAmsA, uththara mImAmsA, srI bhAshyam, etc., from renowned scholar mahA vidhwAn vAdhyAr srI u. vE. srinivasa iyengar (30th pattam swamy's pUrvAsrama father). In the year 1970, he married kamalA ammAL (senkamalam ammAL). 30th pattam swamy, just before ascending to paramapadham, blessed varthamAna swamy with sannyAsa Asramam and handled the mantle of this historical mutt to this swamy. 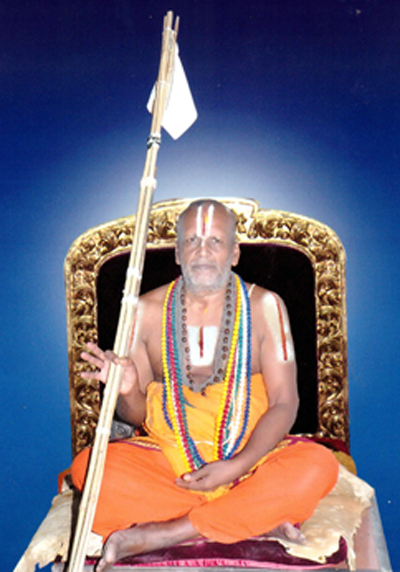 He became to be known as madhurakavi vAnamAmalai rAmAnuja jIyar at that time and is since performing mangaLAsAsanam to srIvaramangA samEtha dheiva nAyakan emperumAn, AzhwArs/AchAryas and also administering this srI mutt. We pray to srIvaramangA nAchiyAr, dheiva nAyAkan emperumAn, AzhwArs/AchAryas that bless us for many many years to come.